Awning windows are as stylish as they are practical. Aesthetically pleasing and offering a solid, sturdy frame, they are sure to enhance any home design. The awning design offers enhanced energy efficiency with an integrated continuous hook hinge for extra sealing. A chain winder system allows easy operation of the sash, no matter what the weather conditions are. 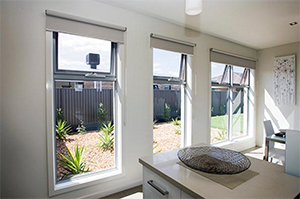 Awning windows are a popular choice for contemporary and architectural designs, particularly complementing facades perfectly and providing advanced functionality and performance. The unique design of awning windows provides superior airflow while protecting your home from dirt, debris and rain. Our range of awning windows is available in Timber and Aluminium with a variety of different sizes and designs offered. Aluminium awning windows are available in the 100, 200 and 300 Series in many powder coat colours. Timber awning windows are made of Meranti, Western Red Cedar or KD Hardwood; and can be treated with the exclusive TimGuard semi finished two coat clear seal, ready for staining or painting as desired.